Over the years the real estate industry and marketplace have shifted but one thing that remains constant is service to the customer. We realized that in order to offer customers an excellent experience we needed to offer them a seamless transaction. So we formed a number of strategic partnerships and executed a number of transactions that positioned KPG for success. These companies are a part of our family and we value each as an important part of our value proposition to our customers, agents and leaders. 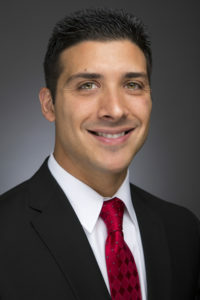 From the launch of the first Keystone Partners Group Keller Williams Real Estate office in the spring of 2001, the organization has since expanded to 9 companies serving much of eastern Pennsylvania and western New Jersey. Over 1,500 agents strong, KPG now maintains a multimillion dollar profit sharing history and an annual gross sales volume exceeding two billion dollars. Keystone Partners Group developed KPG Commercial Realty to trade as KW Commercial, fulfilling the need for commercial services to customers and clients. These specialty commercial services consist of, but are not limited to, sales and/or leasing of Industrial, Retail, Hotel/Motel, Multifamily, Land, Office, and Sports and Entertainment industries. Safeguard Home & Auto grew out of the need and desire for Keystone Partners Group to provide customers and clients complimentary services that relate to their real estate needs. Safeguard provides competitive and complete coverage options from multiple carriers. This fulfills the needs of the customers and clients by providing choice, value, and peace of mind. Keystone Partners Group partnered with Title Alliance (TA) to assist in providing the operational arm for title services. Managed by TA, Greater Montgomery Settlement Services (GMSS) and Keystone Premier Settlement Services (KPSS) provide buyers and sellers the highest level of title insurance and closing service requirements, delivering confidence and satisfaction in the process for the customer’s and client’s greatest financial transaction. Mike Campo launched his first Keller Williams market center in 2001, followed by three additional offices by 2004. The rapid expansion of this group led to the formalized establishment of Keystone Partners Group in 2006, with the purpose of supporting the productivity, profitability, growth, and culture of all market centers in its fold. In concert with that support, KPG is passionately committed to the creation of transformational opportunity for both agent and staff leadership. KPG is now led by Operating Partners Mike Campo, Bob Wells, Shawn Morrow, and Tony Caracausa, Director of Productivity Coaching Usha Patel, and Director of Finance Karen Shive, Director of Operations Debbie Simms and Core Services Growth Director Bill O’Connell. Our headquarters is located in Blue Bell Pennsylvania and serves over 1,500 agents with real estate sales exceeding two billion dollars each year. KPG’s Pocono Market Center was acquired in 2009 and has since blossomed and moved into a much larger home on Park Avenue in Stroudsburg. Pocono also supports four business centers located in Milford, Pocono Pines, Palmerton, and Clarks Summit, with a combined total of 150+ associates. The Pocono Market Center is the #1 office in closed sales volume in their market. 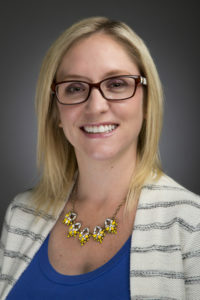 Amy Phillips is the Team Leader of KWPC and is looking forward to answering any questions you may have about her company. KPG’s Allentown Market Center is located in the beautiful West End of Allentown. It is housed in a uniquely stunning stand-alone building on South Cedar Crest Boulevard, that is custom designed to meet and exceed your real estate needs. Our Allentown office was launched in 2004 and is home to 140+ real estate agents. KW Allentown is consistently one of the most dominant real estate offices in the Lehigh Valley. Eric Leadbetter is the Team Leader of KWAL and is looking forward to answering any questions you may have about his company. KPG’s Bethlehem Market Center was launched in 2006 as their fifth addition to the group, and moved into its permanent home on Emrick Blvd in eastern Bethlehem Township during late 2007. KWNC is decisively the #1 company in closed sales volume in the Lehigh Valley and is home to 160+ licensees. 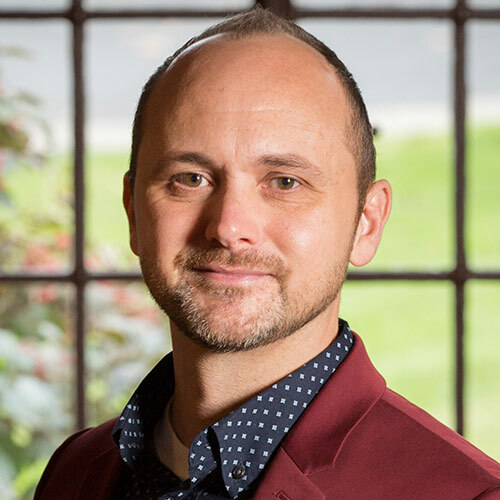 Jason Navilliat is the Team Leader of KWNC and is looking forward to answering any questions you may have about his company. KPG’s Clinton Market Center is our most recent location and was launched during 2015. The Clinton office agent count has already exceeded 120 associates, and their class A office space is located on Route 173 West, and clearly visible from Route 78W in New Jersey. KWCL enjoys a truly world class training facility and is already a dominant competitor in its market area. 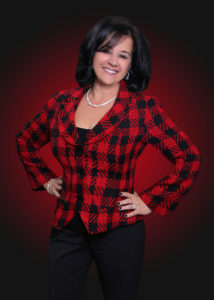 Tara Stone is the Team Leader of KWCL and is looking forward to answering any questions you may have about her company. KPG’s Montgomeryville Market Center is located in a beautiful office building on Route 309 north of the Montgomery Mall. It was the second office of our group, and was launched in 2003. 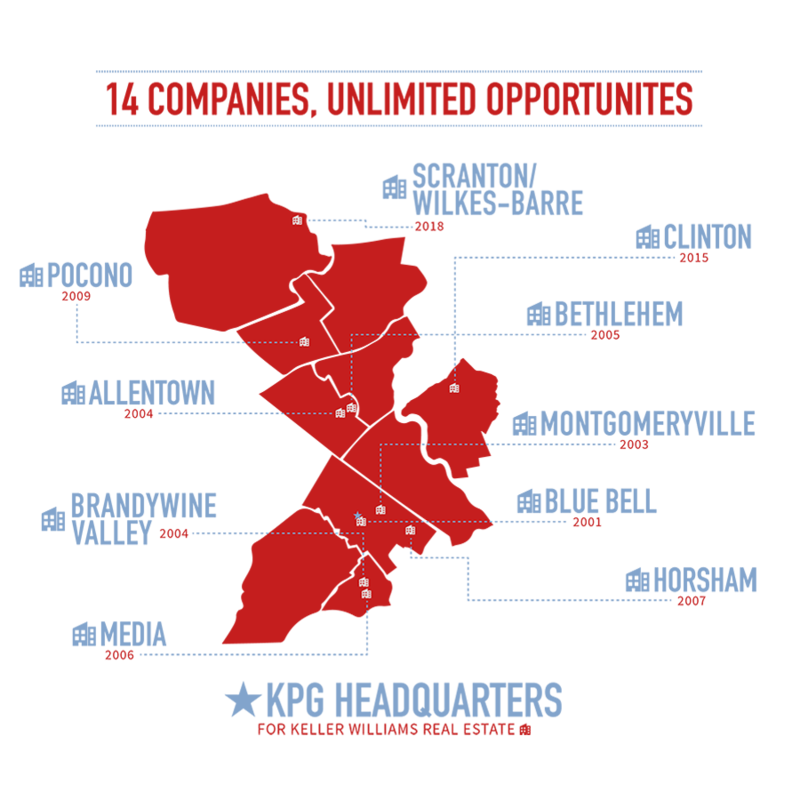 The Montgomeryville office is home to over 130 KW associates and hosts one of KPGs more developed and successful productivity coaching programs. 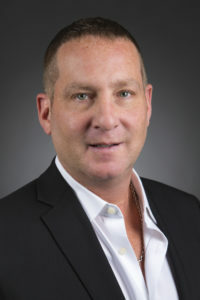 Andy Goodman, an accomplished national real estate sales trainer, is the Team Leader of KWMV and is looking forward to answering any questions you may have about his company. KPG’s Brandywine Valley Market Center is located in Chester County just to the southeast of West Chester University on Dilworthtown Road. The Brandywine Valley office has expanded its physical office space several times since inception, is home to over 150 agents, and continues to flourish in every way. With its highly talented and experienced leadership team standing at the ready, it’s the perfect place for you to take your business to the next level. 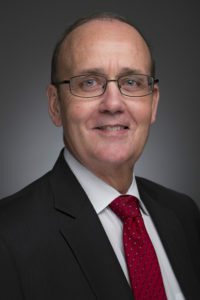 Francis McCarthy is the Team Leader of KWBV and is looking forward to answering any questions you may have about his company. KPG’s Blue Bell Market Center was the first company of the KPG family. Launched in 2001, it was the Keller Williams Home Run office of the year at that time, and even today continually ranks as the #1 most productive and profitable KW office in the Greater PA region. With an agent count in excess of 220 licensed agents, and many of the highest producing agents in their market, Blue Bell continues to raise the bar for performance. Dino D’Orazio is the Team Leader of KWBB and is looking forward to answering any questions you may have about his company. KPG’s Media Market Center dominates the Delaware County real estate landscape in closed sales volume, and fueled by over 160 licensed associates. Located on the ground floor of a beautiful office building on North Providence Road within the Rose Tree Corporate Center, the Media office is the perfect location for growth focused agents to build a business worth owning and a life worth living. Anne Marie Kerezsi is the Team Leader of KWME and is looking forward to answering any questions you may have about her company. KPG’s Horsham Market Center was launched in 2007 and just moved into a state -of-the-art facility on Horsham Road complete with on-site gym and integrated training facility. Poised for continued expansion in every way, the Horsham office attracts top producing agents who are productivity focused, committed to excellence, and excited to share their models, system, and tools with likeminded professionals. 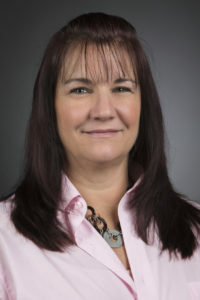 Colleen Whalen is the Team Leader of KWHR and is looking forward to answering any questions you may have about her company.